A COMMUNITY leader has vowed to take his battle to save an Oxford subway to the very top. Oxfordshire County Council today agreed to press ahead with its controversial £2.3m scheme to tackle traffic congestion in Headington. The project aims to improve bus reliability in London Road, improve conditions for pedestrians and give the Headington shopping area a facelift. The scheme, which is the second phase of the London Road improvement plan, is expected to cause nine months of delays for motorists when work begins next spring. The improvements also mean the area’s 1970s subway will be filled in, at a cost of £45,000, and replaced with a pedestrian crossing. Community leader Mick Haines, who collected 2,411 signatures on a petition to save the subway, said he would now take his campaign all the way to Downing Street. Mr Haines, 68, of Crotch Crescent, Marston, said: “It’s absolutely disgusting. The council has got no respect for the will of the people whatsoever. A survey by Headington city councillor David Rundle revealed 61 per cent of residents were in favour of keeping the subway and argued it should be kept — alongside a new crossing. But County Hall said 58 per cent of Headington residents were in favour of scrapping the subway when they realised there would be a replacement crossing. At yesterday’s meeting, council engineer Colin Baird said the current subway would not be permitted under modern building standards as the ramps were too steep for people with mobility problems. He said it would not be possible to accommodate both crossings without an expensive rejig of the first phase of the scheme. Opponents of the work believe the second phase of roadworks between Osler Road and Wharton Road will be more disruptive than the first phase as it involves roadworks at busy junctions in the centre of Headington. But the council said it had learned its lessons from the first phase of the scheme, which over-ran by two months and caused misery for more than 14,000 motorists who use the road every day. The council has suggested pictures of the subway’s colourful murals could be put on a website for people to view after it is filled in. THE go-ahead is set to be given to the second phase of a £3.6m improvement scheme to combat traffic congestion in London Road, Headington. Oxfordshire County Council wants to spend £2.3m to install a bus gate on the arterial route to reduce delays to Oxford-bound bus passengers and spruce up the Headington shopping precinct. Councillors and civic leaders have demanded the authority learns lessons from the £1.3m first phase of the scheme which over-ran by two months and caused misery for more than 14,000 motorists who use the road every day. Headington city councillor David Rundle said: “Everyone acknowledges the first phase did not go well. “The county need to take a deep breath and make sure they are confident this will not be as bad a mess as the first stage. “Stage one was unnecessarily disruptive and this phase is bound to be worse because of the significance of the district centre of Headington. Council officers have recommended the second phase of works for approval and if the plans are rubberstamped next week, roadworks between Osler Road and Wharton Road will begin in spring 2010. The first phase which saw a new outbound bus lane between Gipsy Lane and Osler Road and a 20mph zone between Pullens Lane and Headley Way took ten months and finished at the end of May. The plans will also see a well-used subway in the area controversially filled in and replaced by an above ground pedestrian crossing. 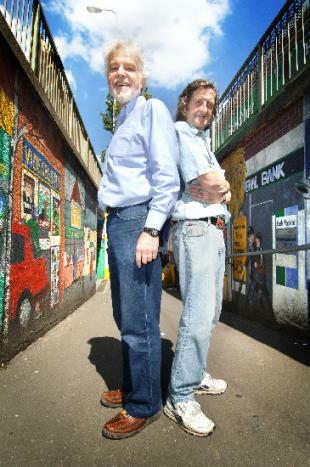 Croft Road resident and community campaigner Mick Haines, 68, gathered 2,511 signatures on a petition in March to stop the closure of the subway. However, the county council said 58 per cent of Headington residents were in favour of the plans when they realised there would be a replacement crossing. James Bloice Smith, of the group Headington Action charity which aims to improve the area, said: “We have been very impressed with the level of consultation. “It’s been hugely better than anything we have experienced before locally. “However, we hope the management and staging of this project is hugely better. Councillor Ian Hudspeth said: “We are of course very keen that an overrun of the nature experienced on the recent London Road roadworks should be avoided. Headington shops are bracing themselves for the works with hairdresser Matthew Clulee claiming he suffered a 35 per cent drop in sales at this London Road outlet during the first phase of roadworks. He said: “It’s unbelievable. The roadworks have been far and away the worst problem for our shop.